This region of fertile and flat lands, mild climate influenced by the proximity to the ocean, extended from the mountains of Caramulo and Buçaco up to the shore, is located in Beira Litoral, between Águeda and Coimbra. The region of Bairrada was a land of conquerors, of fights between Christians and Arabs, early in the formation of Portugal, when the capital of the kingdom was Coimbra and the path was towards south. It was also a land defending the independence, threatened by the invading armies of Napoleon, held at Buçaco. But their vineyards serenely watched all these past convulsions, because its fruits have always been appreciated. Also for this reason, the export of wine to foreign countries began early. Because it is near the sea, the climate is typically Atlantic, with mild and rainy winters, a hot but slightly windy summer. During the ripening period of the grapes, this region registers a great thermal amplitude, sometimes the difference reaches the 20ºC. This phenomenon is responsible for maintaining the acidity of the grapes, giving freshness to the wines that result from them.. The soils are divided in sandy clay and limestone terraces. The vineyards for the production of products with the denomination "Bairrada” must fulfil a regulation that indicates that the grapes have to be "installed on "chalky brown or red" soils, on "litholic humic or not humic" soils, or on podzols of little consolidated sandy materials”. The most representative wineries are of small dimensions. The area occupied by the vineyards doesn’t go over 10000 hectares. Bairrada is a land of many and good wines, made with varieties of high quality, such as Baga, in the red wines, and Bical, in the white wines. Baga is the dominant red variety. The wines made from this variety are full of colour and rich in acids, but well balanced and with great longevity. Recently, the DOC of Bairrada has been allowed to plant international varieties, such as Cabernet Sauvignon, Syrah, Merlot and Pinot Noir, which share the lands with other national varieties, such as Touriga Nacional or Tinta Roriz. The white variety Fernão Pires (of the region named Maria Gomes) is the most planted. There also the varieties Arinto, Rabo de Ovelha, Cercial e Chardonnay. The whites of this region are delicate and aromatic. The sparkling wines of the region are used as appetizers or in the local cuisine. 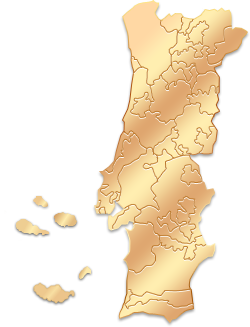 The Region of Bairrada is located in Beira Litoral, between Águeda and Coimbra. Along Beira Litoral you can meet the sleeping waters of Ria de Aveiro and, in contrast, the bustling seaside resort of Figueira da Foz. The old university town of Coimbra deserves to be explored and it is also a good starting point to visit Buçaco. Coimbra is one of the most prestigious cities of Portugal. Its history is, in first place, connected to the history of Conímbriga, the roman city located only 8,7miles away. A visit to the Old Cathedral, the New Cathedral, the National Museum Machado de Castro, the Monastery of Santa Cruz, the Botanic Garden, the Monastery of Santa Clara-a-Velha and the Convent of Santa Clara-a-Nova is recommended. Only 15,5 miles from Coimbra, the thermal station of Luso is inseparable from Buçaco, forest that surrounds it and is classified as national heritage. A visit to the Mealhada Cellars, the national forest of Bussaco, the Convent of the Discalced Carmelites and the Military Museum of Bussaco is recommended. Coimbra A Station or Coimbra B Station / Luso Station. More info: www.cp.pt. Central Station, AV. Fernão Magalhães, Coimbra / Beira Litoral Bus Station, Mata do Bussaco, +351 239 855270 / 232 422822. Coimbra: From the city of Porto, take the A1/Lisboa, take exit 12 for N341 towards Coimbra Sul / Taveiro / Alfarelos. From Lisbon, take the A1/Porto, take exit 12 for N341 towards Coimbra Sul / Taveiro / Alfarelos. Mata Bussaco: From Porto, take the A1/Lisboa, take exit 14 towards N234 / Cantanhede/Mealhada, continue in the EN (national road) 234 to the Bussaco. From Lisbon, take the A1/Porto, take exit 14 towards N23/ Cantanhede/Mealhada, continue in the EN (national road) 234 to the Bussaco. Municipal Tourism Region, Largo D. Dinis, Coimbra, +351 239 832591 / Center Tourism Region, Largo da Portagem, Coimbra, +351 239 488120/ Luso Bussaco, Rua Emídio Navarro, 136, Mata do Bussaco, +351 231 939133.